The mathematician Mark Kac classified geniuses into two kinds. "Ordinary" geniuses were those who accomplished a lot, but who gave you the feeling that you too could be as successful if you worked hard enough. The other kind of genius was the "magician", a person whose thought processes for all intents and purposes were hidden from you and who made you feel that you could not catch up no matter how hard you tried. Kac's distinction does apply, but it's also a little unfair to "ordinary" geniuses who happen to include many Nobel laureates. These ordinary geniuses may not have been Newton, Darwin or Einstein but collectively they were responsible for the underpinnings of most of modern science. 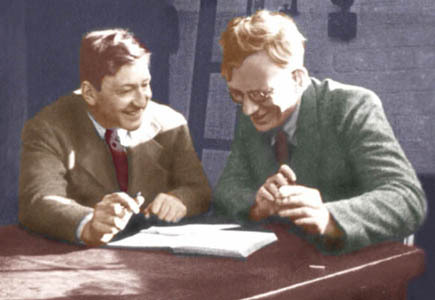 In his book the physicist and author Gino Segre brings two such ordinary geniuses- George Gamow and Max Delbruck- to life. Gamow and Delbruck are not as famous in the public eye as some of their contemporaries like Einstein, Dirac or Feynman but as Segre marvelously demonstrates, they were founding fathers of two of the twentieth and twenty-first century's most important fields- cosmology and molecular biology. Segre does a great job of explaining the two men's discoveries, lives and working philosophies and also paints a vivid portrait of the important times which they lived in. Both started as physicists, Gamow in Russia and Delbruck in Germany. 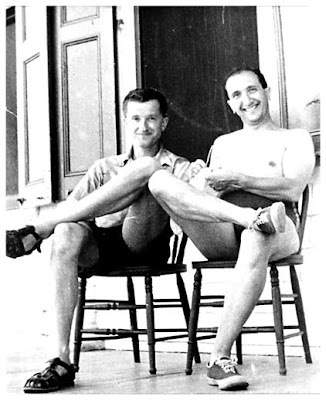 Both grew up amidst war and civil strife and ended up emigrating to the United States as refugees from communism and fascism; Gamow and his wife had to literally flee from the Soviet Union to escape Stalin's yoke. Both were lucky to grow up during the heyday of modern physics when quantum mechanics was being created in Germany, England and Denmark. Gamow made an early name for himself by pioneering nuclear physics while Delbruck floundered as a physicist for some time before finding his niche in biology. The two met in Niels Bohr's famous institute in Copenhagen where they discovered their common interests and struck up a lifelong friendship. One of the biggest virtues of the book is in bringing out the distinctive working style of the two scientists. This style was marked by independence of thought, an unwillingness to follow the beaten track and a relentless enthusiasm for staking out new grounds. Both men were mavericks who, in Gamow's words, were always looking for the next "pioneering thing". Inspired by Bohr, Delbruck turned to molecular biology when the subject did not even formally exist. Thinking of a basic experimental unit in biology akin to the hydrogen atom in physics which would shed light on key biological processes and be amenable to experiment, Delbruck picked bacteriophages- viruses which attack bacteria. Along with another emigre, the Italian Salvador Luria, he performed foundational studies that demonstrated the fundamental role of mutations and their effect on bacterial phenotypes; one of their most important experiments proved that mutations that arise in response to selection are preexisting and not induced by the selection agent. With a few such elegant studies Delbruck and Luria connected genetics to bacteriology. Since then microbial genetics has been the source of some of our most important insights into heredity, genetic engineering and medicine. The phages whose importance they highlighted continue to be tools of incredible utility in our search for genetic mechanisms and new medical therapies. Along with Alfred Hershey, Delbruck and Luria were awarded the Nobel Prize for their work in 1969. While Delbruck was tinkering with viruses, Gamow turned to nuclear and astrophysics when the fields were not too popular. He was the first to explain the so-called bizarre "tunnel effect" in alpha decay, a quintessentially quantum mechanical phenomenon which allows particles to surmount energy barriers which are classically unsurmountable. The tunnel effect underlies many important processes in physics and chemistry, from nuclear decay to the workings of enzymes. But Gamow's main contribution was in formulating the Big Bang Theory which is at the foundation of modern cosmology. He thought longer and harder about the origin of the universe than most of his contemporaries and he did this long before the physicists Arno Penzias and Robert Wilson discovered the cosmic microwave background radiation emanating from the Big Bang, which Gamow had actually predicted. It is a pity that Gamow did not share the Nobel Prize with them. Later in life, Gamow became a world-renowned popularizer of science. His popular physics books inspired many children to study science and his "Mr. Tompkins" series brought the bizarre mysteries of quantum mechanics to the masses. I myself remember being greatly inspired as a child by the wit and insight in these volumes. As if these contributions were not enough, Gamow later turned to molecular biology and collaborated with the founders of molecular biology including James Watson and Francis Crick. He supplied some of the early thinking about the genetic code and even though the details of his ideas were not correct, he stimulated others to think in the right direction. Delbruck himself was inspired by Gamow's ideas. In his later life he became a mentor to a whole generation of biologists, mostly at Caltech and at Cold Spring Harbor Laboratory, who founded the study of genomics. Delbruck contributed as much through his mentorship as through his research. In addition as the book showcases, the two were eminently interesting characters. Delbruck was a man who spoke his mind, not afraid to poke, probe and question until he got to the truth. Gamow's colorful personality has become the stuff of legend. He was a practical joker who used to constantly play pranks on his colleagues and insert jokes even in technical scientific papers. Just one anecdote will suffice; in a bar, some of Gamow's friends once bribed a waitress to startle him by asking him if he was the British physicist Fred Hoyle, the Big Bang Theory's staunchest opponent. Without missing a beat Gamow replied, "Now now, don't throw Hoyle over troubled waters." Gamow and Delbruck showed us not just how to do great science but how to have fun doing it. Max Delbruck's and George Gamow's ideas essentially underlie some of today's most important questions in biology and cosmology. For all of Kac's categorization of geniuses, there is no doubt that the two were extraordinary scientists. We will all continue to stand on their shoulders.